The Kids Consignment Sale by MOMS is the largest nonprofit consignment sale in the Rocky Mountain region with more than $100,000 worth of merchandise. Nearly 200 members of MOMS fill a 29,000 square-foot space with their gently-used children’s equipment, toys, clothes, furniture, books, strollers and much more. Get brand names at 50-90% off retail prices!! Registration will open later this summer! 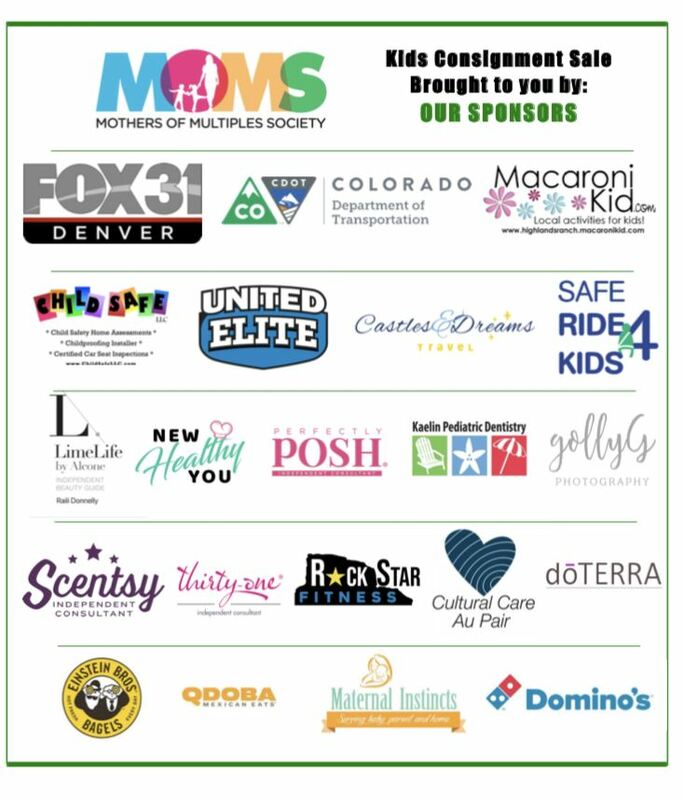 Thank you to our Spring 2019 Sale Sponsors listed below! The Semi-Annual Kids Consignment Sale is located at the Douglas County Fair Grounds, one mile east of 1-25 at exit 181 in Castle Rock. The line starts forming early in the morning for buyers who want the best selection. The public is encouraged to bring a laundry basket or bag to carry their items. Check, Visa, MasterCard with ID or Cash accepted. Consignment at the MOMS Sale is open to the public, check out Become a Consignor or contact sale.director@mothersofmultiples.com. Would you like to showcase your business to our 1,000+ shoppers, 2,000+ Facebook followers and thousands of email contacts? We have Sponsorship & Advertising Opportunities available to meet your needs! Let MOMS help you grow your business!